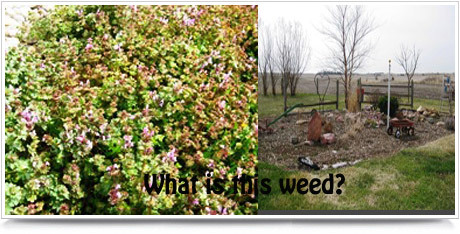 How do I control Henbit? This is henbit. It has a bright purple, tubular flower. It is really visible in mid-April when blooming. In fact, if you drives around the country side at that time in spring you'll probably see a lot of no-till fields that are turning a pretty purple. Although the farmers may not think it's pretty! Henbit is a winter annual and germinated last fall, so spring is not the best time to eliminate a henbit problem. In the spring, when plants appear use a rake or hoe and manually remove them. Because they're annuals, these plants will not grow back. Then apply a nice, 3 inch thick layer of wood chip mulch to reduce germination in the fall. Apply a pre-emergent herbicide like Preen in September, around Labor Day, to kill new plants as seed germinates. Reapply in 5-6 weeks if weather is still warm.